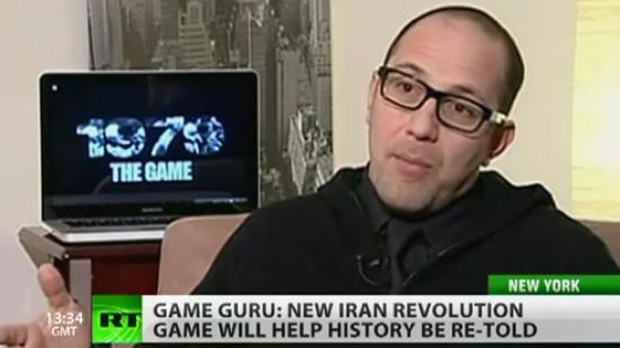 Iranian-born Navid Khonsari -- voice actor, co-director and writer for PS2-era GTAs -- is working on a new game centered around the 1979 Iranian Revolution. Specifically, the happenings surrounding the U.S. embassy hostage crisis. In an interview with a Russia Today lady whose hairdresser lives in the 90s, Khonsari doesn't go into much detail about the gameplay, but instead focuses on how there are not really good or bad guys in a conflict situation like this. He sees it as something that depends on the perspective of the people involved, the context surrounding it, and the way a situation can cause people to become swept up in it. "Nobody is to say that this person is right and this person is wrong. It is just a matter of what the situation is dictating and the legions of people that are making decisions, that has kinda caused this conflict. But the people involved in them might not be the true aggressor. There is a number of different facets to it. And I’m not pointing to say that Americans are bad or Iranians are bad. I’m saying the situation is bad." While I'm not sure how exactly he's going to make this work in a game, it certainly sounds intriguing. The last time a game openly and bluntly gave us any political commentary, we got it via Assassin's Creed: Brotherhood's Shaun Hastings with his snarky notes on the U.S. healthcare system, and the Subject 16 puzzles which paint the U.S. as a Templar/Abstergo-controlled corporate state. Khonsari's concept sounds like a game approach to humanizing the 1979 Iranian Revolution period in a way Persepolis has done before through animation, with maybe a touch of GTA's trademark social and political commentary. Perhaps he's right, and hopefully he will succeed in generating a form of awareness, understanding and dialogue through the medium of videogames that hasn't been achieved before. No matter how it ends up, I'll gladly take his attempt over "Big Strong Western Man Shooting Brown People For Points Game #69" anytime.